As a result of the long-term evaluation of many industrial field wireless technologies and standards, Yokogawa has concluded that the reliability of the radio physical layer is crucial to achieving stability of the whole wireless system, and holds this conclusion as a design policy. Yokogawa calls this "Reliable Radio", and has evaluated its effects in laboratories and in the field. This paper presents the technological background behind it and the evaluation results. Wireless systems are also a means to configure integrated digital networks in plants and are expected to contribute to safe and stable plant operations, conserving the global environment, improving operation efficiency, and so on. On the other hand, anxiety about reliability and stability must be eliminated for wireless systems to be widely used. The demand for reliability and stability is severe especially when it is applied not only to monitoring but also to control. Yokogawa believes that maximum effort to ensure reliability of the physical layer is crucial to securing stability of wireless communication systems. Yokogawa calls this "Reliable Radio", and has made a highest priority of developing new products with this objective. Through the comparison and evaluation of many industrial field wireless technologies and standards, Yokogawa has concluded that the wireless communication standard ISA100.11a for industrial automation is best suited for achieving the "Reliable Radio" technical concept, and has decided to apply this standard to its products. Yokogawa has been leading the world in commercializing ISA100.11a conformant field wireless products. Wireless communication uses radio waves radiated into space, thus it has peculiar characteristics not found in wired communication. 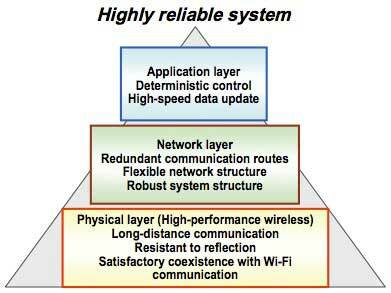 These characteristics are relevant to the physical layer of wireless communication. As shown in Figure 1, in general, the stability of the lower layer determines the stability of the whole system in a communication system with a layered structure. This is Yokogawa's design policy based on its longtime experience and knowledge of communication in the field of process automation. Thus Yokogawa aims at an architecture where instability and uncertainty in the physical layer are removed as much as possible, and where the reliability is further reinforced by the upper layer. Since transmission power is limited by regulations, performance of receivers is crucial for ensuring the reliability of the physical layer. This is proven by field experience accumulated through conducting surveys at more than 100 customer sites worldwide with the direct involvement of development engineers. A transmitted signal attenuates as its propagation distance increases and reaches a receiver buried in other signals such as natural background noises, reflected waves, and signals of other wireless systems (referred to as "undesired wave"). The receiver extracts and identifies the signal necessary for the communication (hereafter called "desired wave") from the whole signals received. Thus the detection capability of the receiver represents the critical effect on communication reliability. The performance of the receiver is the technical basis for achieving long distance, highly reliable field wireless communication which is resistant to radio reflections at plant sites where metal tanks and pipes are randomly arranged (hereafter called "pipe jungle"), and to disturbance from other wireless systems. The details of the technology for this will be described below. There are several standards for industrial wireless systems. Most of them, including the ISA100.11a, apply the IEEE802.15.4 for the physical layer. Although the performances of systems are often misunderstood to be the same if they apply to the same physical layer, it should be noted that the performance is not determined simply by the applied standard. In other words, the performance differs from system to system even if they are based on the same standard because there is some design flexibility in areas not directly related to the technologies defined by the standard. It is also important to flexibly incorporate the technology of wireless transceiver IC chips, the performance of which is rapidly progressing. The ISA100.11a protocol is based on an OSI reference model composed of 7 layers, and the physical layer is independent from the other layers. Therefore, the IC chips with the best performance available can be flexibly used for the physical layer. Meanwhile, the processing capability of an IC chip is in a trade off with its power consumption. Lower power consumption is important for industrial field wireless devices to work for an extended time with batteries. However, if a device is designed to operate with such low power as to degrade its receiver processing capability, it causes a wireless system to be less reliable in terms of communication distance and tolerance for various interferences or disturbances. Therefore, to improve wireless reliability, it is crucial to optimize the power consumption allocation to each part in a field wireless device and to design it keeping a balance of the trade off with performance. The ISA100.11a is a standard which contains the architecture best suited for such a design. The importance of wireless reliability was discussed in the previous section. In this section, the importance of the method for objectively evaluating reliability is discussed. The most usual method to evaluate receiving quality, including the effect of interference and disturbance in industrial wireless communication, is to check the packet error rate (PER). The PER is the percentage of the number of packets that failed to be received correctly to the number of whole packets transmitted. The PER is also one of the factors determining system throughput and latency. Another method is to check the received signal strength indication (RSSI) to verify the reliability of field wireless communications. The RSSI is a function of a wireless device that measures field strength of a desired wave by itself at a receiving point, and its measurement result is expressed as the absolute value of field strength (unit: dBm). If the relation between the PER and RSSI of a wireless device is known, its installation location can be designed in a way to select a certain RSSI value so as to ensure the required PER value. However, even if the received signal is deteriorated by the interference caused by undesired waves, the RSSI value simply indicates the whole field strength. Therefore, the same RSSI value does not guarantee the same PER value after demodulation. Also it should be noted that the accuracy of the RSSI measurement differs among products. 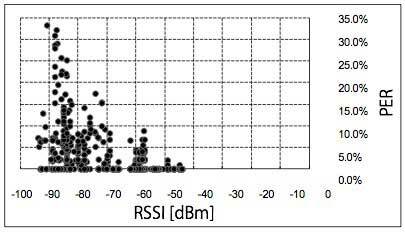 Figure 2 shows the relation between RSSI and PER measured at a field site by Yokogawa. PER values for an identical RSSI value are distributed in a wide range, and no simple correlations are found between them. Thus, the measurement of the PER is essential for judging the reliability of wireless communication in actual fields. The reliability of wireless communication most directly impacts on the communication range, and the PER is the quantitative criterion for the communication range. For example, the evaluation criterion becomes clear by defining the communication range to be the maximum distance within which the PER value stays lower than or equal to the prescribed value. Actual evaluation results of communication distance in an actual field are shown in Figure 3. In this evaluation, Yokogawa's product conforming to the ISA100.11a and a prototype which Yokogawa developed earlier based on another standard were used. They were placed at a dry riverbed where there were no obstacles in the line of sight, and the relation between PER and distance was measured and compared. With the product, almost no packet errors were detected up to a distance of 600 m whereas some packet errors were detected at about 200 m with the prototype, showing that the communication distance of the ISA100.11a conformant product is about three times longer than that of the prototype. This means that the ISA100.11a conformant product supports longer distance communication without repeaters. Fewer numbers of repeaters achieve less installation labor hours and lower cost of infrastructure including batteries and battery replacement. This also achieves electric power saving in the total field wireless system. In industrial plants, radio waves are reflected by many metallic pipes and tanks and reach the receiver via multiple paths. To evaluate the effect of the multipath objectively and quantitatively, a phasing simulator was used. The phasing simulator is a device which is placed between a transmitter and a receiver and acts on the actual communication signal to simulate the multipath according to a pre-programmed model in the laboratory. The evaluation results are shown in Figure 4. First, the PER of the ISA100.11a conformant product and the prototype based on another standard were measured without the multipath and compared. The results are shown as lines (1) and (2), respectively. In this measurement, an open space with no obstacles and no multipath was simulated. The attenuation rate setting of the simulator corresponds to communication distance, the horizontal axis of Figure 4. 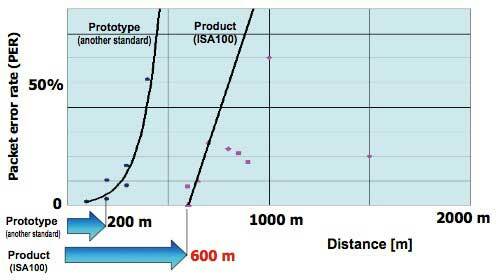 As shown, PER remains zero up to about 600 m with the product while PER starts to rise at about 200 m with the prototype. These results match the actual results described in the previous section, showing that the simulator can simulate the actual field environment adequately. Next, the PER was evaluated with the multipath simulated, the results of which are shown as lines (3) and (4) in Figure 4. 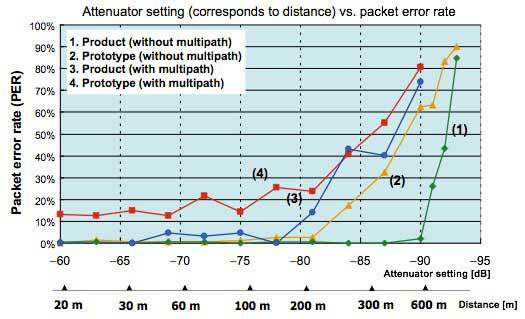 In the multipath environment, PER remains zero up to 200 m with the product. On the other hand, PER is more than 10% in the range of 20 m to 200 m with the prototype. These results also match the evaluation results which we experienced at actual fields. The IEEE802.15.4 uses the spread spectrum technology which has the capability to isolate and identify a desired wave from multipath waves. Even though the product and prototype conform to the same physical layer standard, their PER are different. This is supposed to be due to the difference in performance between their correlation filters performing that isolation. ISA100.11a based wireless communication uses 2.4 GHz industry science medical (ISM) band, which does not require a license as long as the output power is below a certain value. Thus, multiple wireless systems using this band can coexist. 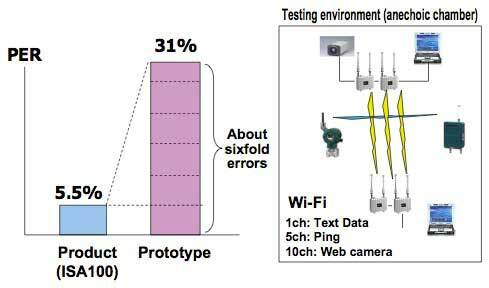 Figure 5 shows the PER evaluation results when the wireless system coexists with a Wi-Fi system. A Wi-Fi communication environment was configured in an anechoic chamber, and the mode of high data traffic through image transmission was set up. Industrial wireless communication was then performed in this environment and the PER of the ISA100.11a conformant product and the prototype were measured and compared. The PER of the product was 5.5% while the PER of the prototype was 31.0%, which was about 6 times better than the former. This is also relevant to the performance of a receiver described in the section "Importance of Receiving Performance." This difference is supposed to be due to the difference in performance of processing such as band- pass digital filtering to eliminate leaking from neighboring channels, and correlation filtering to eliminate disturbance directly entering the frequency band of the desired wave. For multiple wireless systems to coexist, although the capability to directly eliminate disturbances is required, another method to apply the function called black channel listing is available, which manages frequency resources so as to avoid channels listed as unreliable. 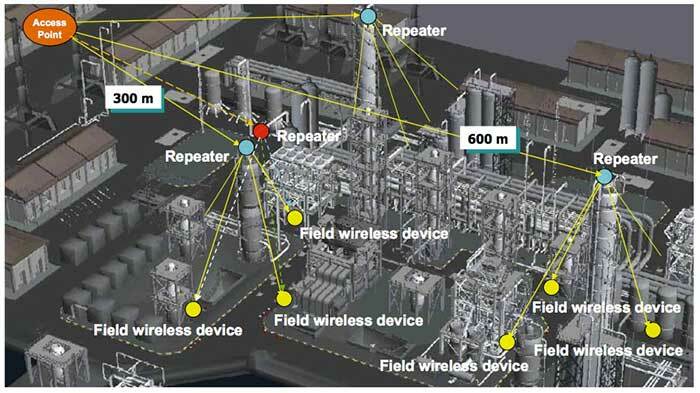 Yokogawa has been proposing installation design of field wireless devices based on the "Reliable Radio" concept. An example of installation in a plant is shown in Figure 6. Making the best use of long distance communication capability in the upper air with a good line of sight, access points and repeaters are located at high points to establish the first hop communication. Then, making the best use of the multipath resistant feature, the second hop communication in a downward direction from the repeater to each field wireless device in the pipe jungle area is established. In this way a high quality wireless network with low PER can be configured even in a wide area and in harsh environments such as pipe jungles. When introducing field wireless communication to industrial monitoring and control, its reliability and stability need to be secured with the highest priority. The reliability of the whole wireless system mostly depends on the reliability of the physical layer for wireless communication. Yokogawa has evaluated various wireless technologies and standards and has finally selected ISA100.11a as the best choice. Wireless communication technology is a new, crucial one for achieving an integrated digital network together with the wired digital fieldbus technology. It is also expected to contribute to more safe and efficient plant operations through the enhancement of plant monitoring, control and diagnosis.